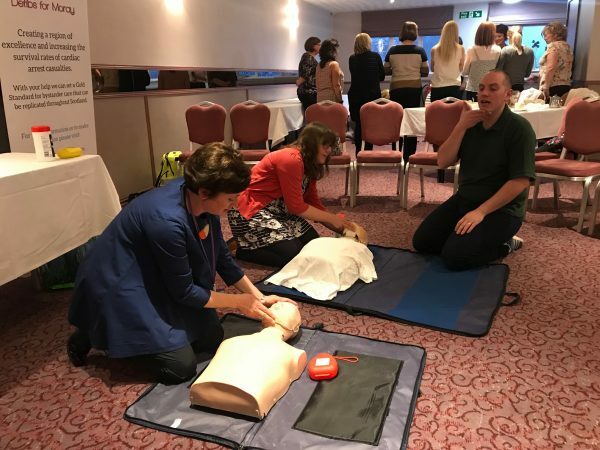 Our April event was the chance for MBW’s chosen charity for 2018, Defibs for Moray to demonstrate what they can do. After an excellent high tea provided by The Laichmoray Hotel, Dave and Greg from Defibs took to the stage. 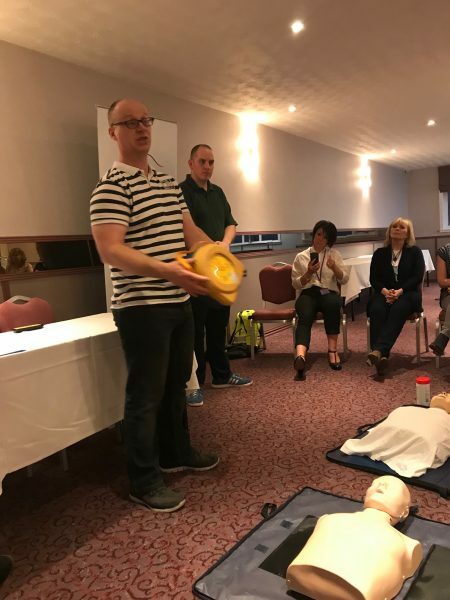 Defibs for Moray is a new charity, set up in 2017 by Ken Glass. Unfortunately, due to illness Ken was unable to attend the evening, but his partners Dave and Greg did a great job of telling his story. Ken suffered a heart attack in Findhorn last year whilst playing football. Dave his friend, who was trained in CPR was able to give life saving treatment for 19 minutes, until the ambulance arrived. Which is where Greg took over as part of the ambulance crew with their defibrillator machine. Ken has gone on to make a full recovery and the Defibs team have made it their mission to get as many defib machines in the local area, to ensure anyone in the same situation as Ken can get the best treatment as soon as possible. The evening progressed with a demonstration of CPR and an opportunity for some of us to have a go. I found out it’s surprisingly hard to pump someone’s chest for any length of time! We were then shown how the defibs machine actually works. It’s very straight forward and speaks instructions to you all the way through. These are really incredible units and Defibs for Moray are doing an amazing job getting them put up in the local area. Receiving basic training on how to carry out CPR and learning how vital it is to keeping a person alive in those first few minutes of heart failure is available to anyone interested. As a new charity Defibs Moray would be grateful of any help/support that any MBW members could offer, particularly in marketing and ideas for fund raising and merchandise. It was a really educational evening, and Dave and Greg made a great comedy duo! I hope I never have to use one of their units, but knowing they are there is very reassuring! Our guest blogger, photographer and videographer was MBW Committee Member Clare Lock of clockstudio (www.clockstudio.co.uk). Thank you Clare!